Hartwell is unusual in having two Memorials, an oak obelisk in Forest Road and a stone cross in the Churchyard. In the 1920s, following disagreements among villagers concerning the type and site for a Memorial, it was determined that two Memorials would be erected. One in the Churchyard for those who thought this the most suitable resting place for their forefathers. The second, a wooden obelisk, in the centre of the Village, to reflect the influence of Salcey Forest in the village. Both Memorials record the names of all the men who gave their lives in the First and Second World Wars. Further information can be found on p36 of The Parish Appraisal 2000. See bottom of this page for link. The Parish Council is responsible for the upkeep of the oak obelisk in the centre of the Village. According to records the original wooden memorial which was erected in 1920 was made from a 1000 year old tree that was given to Hartwell by the Forestry Commission. Unfortunately by 1964/65, it had fallen into decay. Timber for replacement was sawn from another oak tree again provided by the Forestry Commission from Salcey Forest. 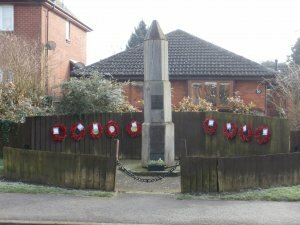 This replacement memorial was dedicated on Remembrance Sunday, November 14th 1965 by Revd H P Fuller and Revd Douglas A Smith. A Service of Remembrance is held at this memorial each year which is followed by a Service in the Church. 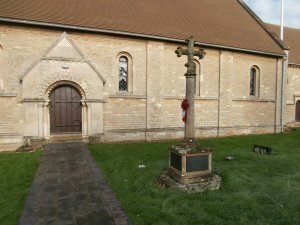 The stone Memorial in the Churchyard was unveiled and dedicated on 4th December 1920 by Lt. Colonel Sir Herward Wake, DSO, CMC. The cross Memorial was then dedicated by the Bishop of Leicester.